Stephan has been with NOC for 20 years and has the ability to guide all 7 of our rivers. Originally from Florida, Stephan is our resident plant expert with a degree in Botany from the University of Florida. Other guides have been known to follow closely to his raft to learn more about the local fauna. But, that isn't all he knows. 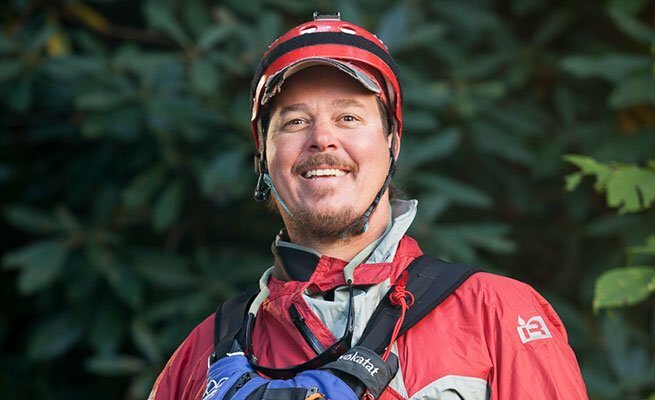 Stephan is also one of our primary Raft Guide School instructors as well as an instructor for Swiftwater Rescue and Wilderness Medicine Courses. One of his greatest achievements has been rafting the Colorado River through the Grand Canyon, AZ a total of 3 times. In addition, he is extremely proud that the SCC Faculty Team has beaten the student team for the past 5 years in the Outdoorsman Triathlon. In his off-time Stephan enjoys playing the mandolin, plants, cooking and regularly schooling everyone at our weekly Ultimate Frisbee games.